Cobra Exterminating was started in 1987 by Carl E. Brown Sr. It is his passion, it is his career, and he's great at it. Not only that, but he's an honest man who runs an honest business. He won't ever sell you services you don't need, and he runs his company in such a way that you'll be pleased with his services. If you have pest control problems, including the need to remove a bed bug infestation, we would be honored to serve you. 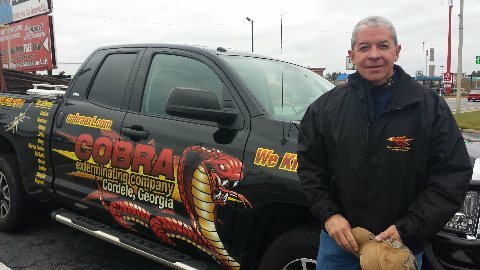 You'll see us around town-- just look for the trucks with the Cobra on the side. We are local to Cordele, GA, but travel all of Middle Georgia and into South Georgia with bed bug eradication services. Our business is family owned and operated, and has been for more than 25 years.